Destination weddings certainly spruce up your wedding by more than a couple of notches and every couple wants a perfect wedding affair. And all the more better if it’s by serene and beautiful waters, right? Tell you what, skip your over-done Goa ideas and check out these fabulous venues in Kerala, God’s own country that’ll offer an ideal setting for an unforgettable wedding experience! But if you still want to stick with the standard beach-side location in India, check out some great Goa wedding venues here! We all know The Leela as a venue with the utmost class, luxury and opulence. And the one at Kovalam, Kerala certainly matches up to all of those. What’s more is that it’s a short distance from Trivandrum International Airport, making it easy to get there. They have a connected beach, allowing you to have a beautiful beach ceremony and then maybe head into one of their spacious halls for any other wedding event. Their convention centre is the largest in Kerala and can accommodate 900 guests. The Zuri Kumarakom is situated on the banks of India’s longest lake, Vembanad Lake. Mridangam, one of the largest venues of its kind in Kerala can be divided into 2 smaller halls called Bhairavi and Poorvi to accommodate your required number of guests. They have flexible seating as well as décor arrangements that would make sure your wedding is personalised and delivered exactly how you’d like it! The hall accommodates up to 176 guests theatre-style, 46 guests U-shaped, 93 guests classroom-style and receive about 200-250 guests. The Raviz Kollam is located on the shores of the Ashtamudi Lake and is one of those traditional wedding venues which highlight Kerala heritage. Influenced by the Nallukettu style of architecture of Kerala, The Raviz Ashtamudi is a beautiful amalgam of traditional styles meeting a contemporary presentation. With custom-made wooden cottages, private islands and a large houseboat known as 'Randhal', the Raviz Kollam should be on your list of top destination wedding venues in Kerala. The banquet hall is rather spacious and has a capacity of 1000 guests. They also house a Kerala Ayurveda Spa that you and your guests could indulge in. Having a wedding at Le Meridien, Kochi will ensure that you have a blissful wedding experience. Their experienced event planners ensure that you forget the hassle of overlooking the arrangements for your wedding. Their hotels landscaping, lush greenery and excellent view of the backwaters paint the perfect backdrop for most romantic occasion, while the extensive array of venues adapt to weddings of all sizes and styles. Oman-Hall, the largest pillar less hall in South India and one of Kochi’s most unique venues for banqueting and receptions, can cater events up to 2500 guests. Additional banquet spaces such as Nayanar Hall, Amphitheatre are perfect for receptions, cocktail parties. They also have great wedding offers and packages with compliments. This is one of the best resorts in Kumarakom and has a 150-year-old story to tell. The bungalow, built by English missionary, Henry Baker, is often called the little jewel of Kumarakom. Vivanta by Taj - Kumarakom still maintains the beauty of its rustic surroundings on the banks of Vembanad Lake. The renewed heritage rooms and charming cottages, the luxury villas and the refurbished Temptation pool villas will have you and your guests experience an authentic yet contemporary Kerala-style affair. Kumarakom Lake Resort, surrounded by lush landscaped greenery and twinkling streams, is oft chosen to witness the happiness of couples on the threshold of a new beginning. Theme weddings are styled and executed with perfection, right from the traditional young damsels with welcome lamps at the entrance or a flowered arch at the bottom of a aisle replete with fresh petals to a soft live band or a dream menu that's tailored to your choice. With experts to guide you to make the right choices right from the colour of the bouquet to the choice of desserts and the seating of guests, Kumarakom Lake Resort offers premium personal service that caters to every requirement and ensures every comfort yet does not intrude your privacy. It is placed amidst exotic surroundings that comprised of alluring attractions of the city. The hotel is blessed with excellent accommodation arrangements in the presence of fully furnished rooms and suites. The staying facilities are majestically complimented by the traditional Indian hospitality at this five-star property. Moreover, the extensive premises of the hotel consist of ideal arrangements for events. The beauty of Crowne Plaza Hotel Cochin is also determined by well-facilitated and well-modernized banquet halls. These rooms are perfect places to organize your wedding event as they are outfitted with all necessary facilities. The Ramada Cochin is one of the best backwater wedding venues in Kerala. Nestled on the banks of the banks of the Kumbalam Lake, the Ramada Cochin is a serene get-away from the hustle and bustle of the busy city life. The perfect setting to unwind, with cool breeze and placid bay waters, the Ramada Cochin offers beautiful wedding venues with wide open views of Kochi under the sky. The resort offers three conference & banquet facilities, in capacities ranging from 80 to 450 guests. The Lakesong Resort Kumarakom ranks among the finest of destination wedding venues in Kerala. This is primarily because of its rich and earthy ambiance and scenic venue set up. If you are a nature lover, then look no further for the perfect venue. The main attraction here is the villas that are based on the traditional Malabar style architecture. 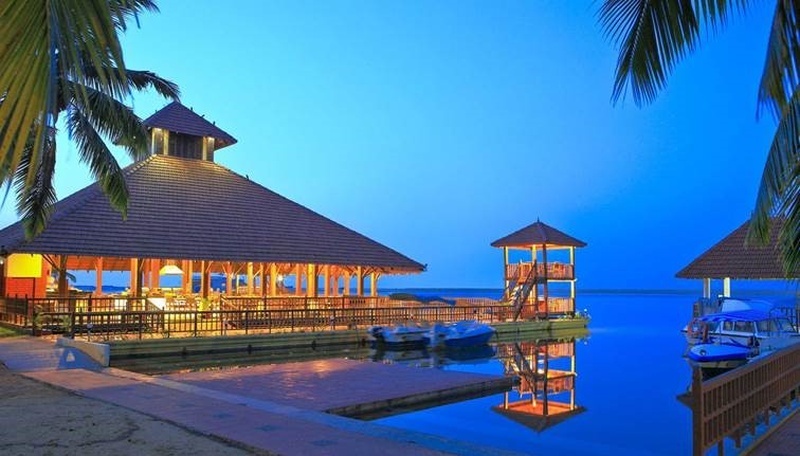 Island wedding venues in Kerala include the Poovar Island Resort in Trivandrum. Travel to the island on a houseboat and hold a secluded private function far away from the hustle and bustle of the city. You can choose between floating cottages and land cottages for accommodation at their charming Kerala Ayurveda resort and enjoy a boat cruise along the palm-fringed shores of bewitching backwaters. The gentle ocean breeze, swaying palms and golden sands around the venue add a romantic touch to your special day.